Sorry, this entry is only available in “Japanese”. On January 23, 2019, the second subcommittee meeting of FY2018 was held by of the Kino-oka group at Osaka University Nakanoshima Center. 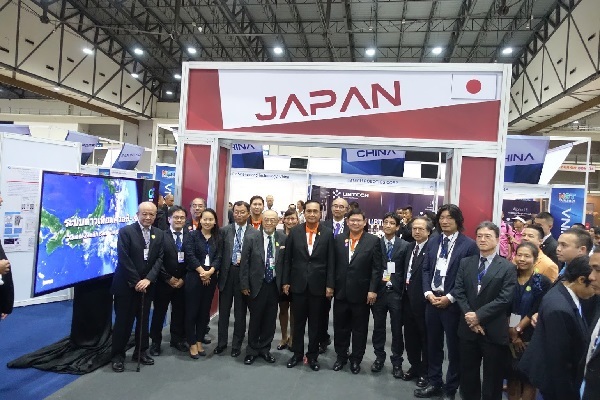 It was attended by program supervisor Dr. Nakahata , personnel from the Ministry of Economy, Trade and Industry(METI）and personnel from the Japan Agency for Medical Research and Development (AMED). In the meeting, companies and academia reported on the results of the project’s 5 years and activity schedule after the project. SCA held the conference to publish the result of AMED project ‘Manufacturing Technology for Industrialization in the Field of Regenerative Medicine (Cardiomyocytes, Nerve, Retinal pigment epithelium,and Livercells）’ jointly with AMED at Ito Hall of The University of Tokyo on December 21, 2018. The venue with a capacity of 400 people was almost full, and active discussions have been carried out at poster presentations. SCA exhibited the poster of SCA outline at TISSUE ENGINEERING & REGENERATIVE MEDECINE Exposition 2018(TERMEX2018) on September 4th,2018 at Kyoto International Conference Center. TERMEX2018 was held as the pre-meeting of “2018 Tissue Engineering and Regenerative Medicine International Society World Congress in Kyoto”(2018TERMIS-WC). Mr.Wada,ABLE Corporation,presented the outline of SCA. 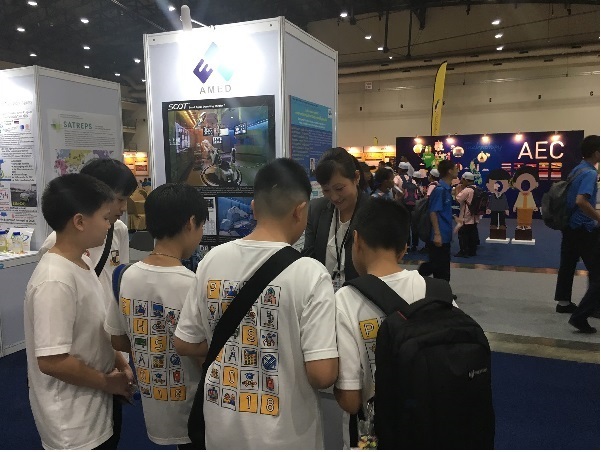 The research and development content of Prof. Kino-oka’s group was introduced at AMED booth in the “Thailand National Science and Technology Fair 2018” on 16th to 26th August, 2018. Prime Minister General Prayuth Chan-ocha, and Minister of Science and Technology Suvit Maesincee also had visited while many engineers, researchers and students visited and heard the explanation eagerly. Furthermore, it has been presented certainly to Mr. Sadoshima (the Japanese Ambassador to Thailand). On July 19, 2018, the first section meeting of FY2018 was held by of the Kino-oka group at Osaka University Nakanoshima Center. It was attended by program supervisor Dr. Nakahata , personnel from the Ministry of Economy, Trade and personnel from the Japan Agency for Medical Research and Development (AMED). There was a vigorous discussion on the progress of the fiscal 2018 research plans and the orientation for the future at the meeting. On July 18, 2018, the second Japan Agency for Medical Research and Development (AMED) development conference of fiscal 2018 was held by the Nakatsuji group of Kyoto University at Kyoto University Institute for Advanced Study (KUIAS). It was attended by program supervisor Dr. Nakahata, personnel from the Ministry of Economy, Trade and Industry and AMED. The progress of the fiscal 2018 research plans was reported. The next conference is scheduled to be held on October 23, 2018. On February 6, 2018, the fourth user forum was held by the Kino-oka groups of the Japan Agency for Medical Research and Development (AMED) project in National Institute of Advanced Industrial Science and Technology （AIST）Tokyo Waterfront. After two key note lectures, the progress of the project was reported. It was held for the purpose of absorbing the needs of parties who will be the users of the project and reflecting them in the project’s promotion. The confab session was a scene of lively interchange. 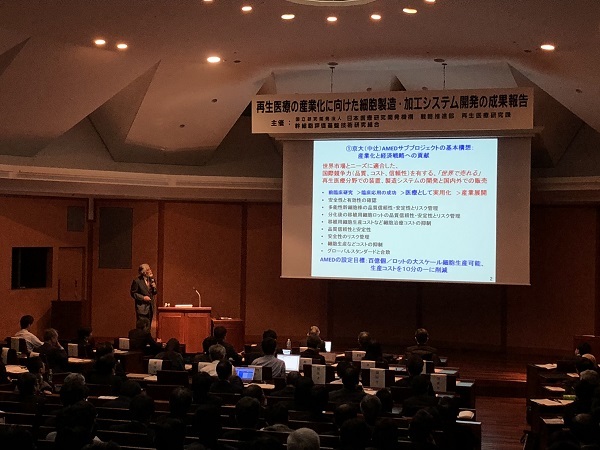 On January 30, 2018, the fourth Japan Agency for Medical Research and Development (AMED) development conference of fiscal 2017 was held by the Nakatsuji group of Kyoto University at Kyoto University Institute for Advanced Study (KUIAS). It was attended by program supervisor Dr. Nakahata ,personnel from the Ministry of Economy, Trade and Industry and AMED. The progress of the fiscal 2017 research plans was reported. The next conference is scheduled to be held on April 17, 2018. On January 29, 2018, the second section meeting of FY2017 was held by of the Kino-oka group at Osaka University. It was attended by program supervisor Dr. Nakahata , personnel from the Ministry of Economy, Trade and personnel from the Japan Agency for Medical Research and Development (AMED). There was a vigorous discussion on the progress of the fiscal 2017 research plans and the orientation for the future at the meeting. 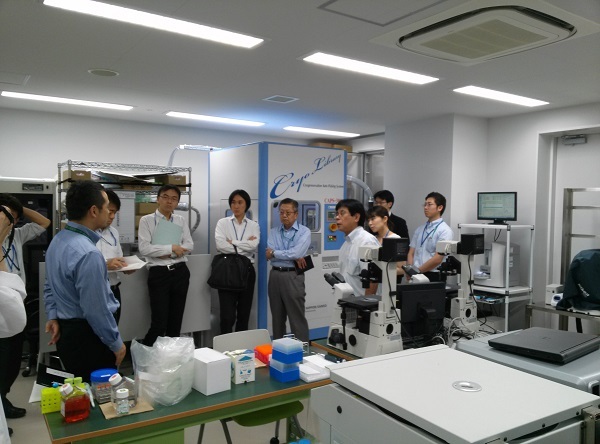 On October 11, 2017, 25 persons from academia, companies, and institutions including the Ministry of Economic Affairs, Ministry of Science and Technology, and Chung-Hua Institution for Economic Research (CIER) visited Osaka University’s Centralized R&D Laboratory to see its equipment. They received a general explanation from SPL Masahiro Kino-oka, and a lively discussion was held concerning how things will take shape going forward. The 2nd UK-JAPAN Life Innovation Symposium held by the Nakatsuji AMED Subproject group of Kyoto University and Kanagawa Prefecture took place on October 10th (Tuesday) at the Life Innovation Center in Kawasaki. A total of 63 people participated, including key persons from British companies and groups, and people from academia, companies, the Ministry of Economy, Trade and Industry and AMED taking part from Japan. The event hosted a lively discussion of cooperation between Britain and Japan in regenerative and cell therapy, as well as other areas in the field of life science. On July 26, 2017, the second Japan Agency for Medical Research and Development (AMED) research development conference of fiscal 2017 was held by the Nakatsuji group of Kyoto University at Kyoto University Institute for Advanced Study (KUIAS). It was attended by personnel from the Ministry of Economy, Trade and Industry and AMED. The progress of the fiscal 2017 research plans was reported. The next conference is scheduled to be held on October 24, 2017. On May 15, 2017, the first section meeting of FY2017 was held by of the Kino-oka group at Osaka University. It was attended by program supervisor Dr. Nakahata and personnel from the Japan Agency for Medical Research and Development (AMED). On April 18, 2017, the first Japan Agency for Medical Research and Development (AMED) development conference of fiscal 2017 was held by the Nakatsuji group of Kyoto University at the Institute for Integrated Cell-Material Sciences (iCeMS). It was also attended by personnel from the Ministry of Economy, Trade and Industry and AMED, and was devoted to presentations of the research results of fiscal 2016 and the research plans for fiscal 2017. The next conference is scheduled to be held on July 26, 2017. On April 1st, SCA concluded a contract for outsourced research and development in FY2017 with AMED. Mesenchymal projects finished in the previous fiscal year, and the structure of research projects has been altered. R&D products of the AMED project is released (it is not available in English version). The projects of Nakatsuji group and Kino-oka group will continue for two more years, and the project of Akutsu group will be finished at the end of March, 2017. The second mesenchymal stem cell section meeting of fiscal 2016 was held by the Akutsu group at the SCA conference room on February 13, and was attended by personnel from the Ministry of Economy, Trade and Industry and the Japan Agency for Medical Research and Development. This section meeting was the last one in the project. The progress of three-year research plans and the results including launched products were presented. There were lively discussions on the results. On February 3, 2017, the third user forum was held by the Kino-oka and Akutsu groups of the Japan Agency for Medical Research and Development (AMED) project in the Tokyo Branch of the Graduate Schools of Medicine and Engineering of Osaka University (Nihonbashi Lifescience Building). After two key note lectures, the progress of the project was reported. It was held for the purpose of absorbing the needs of parties who will be the users of the project and reflecting them in the project’s promotion. The confab session was a scene of lively interchange. On January 31, 2017, the third Japan Agency for Medical Research and Development (AMED) development conference of fiscal 2016 was held by the Nakatsuji group of Kyoto University at the Institute for Integrated Cell-Material Sciences (iCeMS). It was attended by personnel from AMED. The progress of the fiscal 2016 research plans was reported. The next conference is scheduled to be held on April, 18, 2017. On December 13, 2016, Nikon Corporation and Shibuya Corporation made a press release announcing co-development of an incubator with automated observation function for production of regenerative medicine products, which was a result of the Kino-oka group of the AMED project. 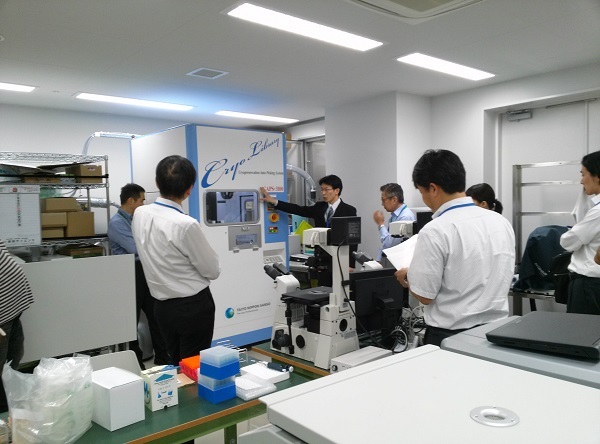 On December 6, 2016, Ms. Camelia Chen, Deputy Director of Industrial Development Bureau, Ministry of Economic Affairs of Taiwan and Dr. Leah Lo of Medical and the Pharmaceutical Industry Technology and Development Center of Taiwan and 8 people visited the centralized R&D lab of Osaka University. They observed the apparatuses and the system and Prof. Kino-oka, sub-project leader, gave a brief review. There were lively discussions on future development. On September 26, 2016, Sumitomo Bakelite Co., Ltd. made a press release announcing development of a kit for measurement of differentiation potential of mesenchymal stem cells to bone and cartilage cells, which was a result of the AMED project. 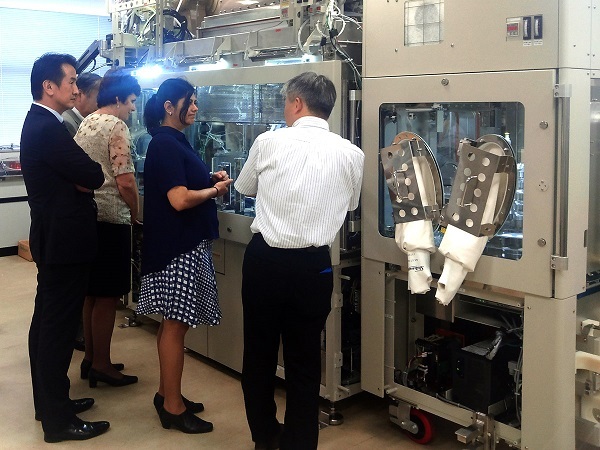 On September 20, 2016, Dr. Yio-Wha Shau, vice president and general director of Industrial Technology Research Institute (ITRI) of Taiwan and one member of ITRI visited the centralized R&D lab of Osaka University. 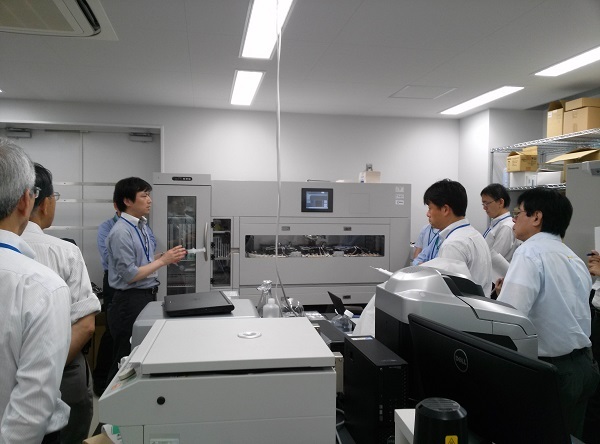 They observed the apparatuses and the system and Prof. Kino-oka, sub-project leader, gave a brief review. There were lively discussions on future development. On September 2, 2016, the Japan Agency for Medical Research and Development (AMED) steering conference of FY2016 was held at the AMED conference room in order to draw advice and recommendations about management and progress of the project from external experts. There were lively questions and answers on the reports by the program supervisor and the sub-project leaders. On August 25, 2016, the opening ceremony of the Life Innovation Center in Kawasaki City, Kanagawa was held, where the centralized R&D lab of the Nakatsuji sub-project group entered. The ceremony was grandly held with attendance of Mr. Kuroiwa, Kanagawa Prefectural Governor and about 200 guests. On August 9, 2016, Dr. Nares Damrongchai, CEO of TCELS (Thailand Center of Excellence for Life Sciences), a public organization, and two people of TCELS visited the centralized R&D lab. of Osaka University. They observed the apparatuses and the system at the lab. and Prof. Kino-oka, sub-project leader, gave a brief review. There were lively discussions on future development. The second Program Supervisor/Sub-project Leader Conference of fiscal year 2016 was hosted by the Division of Regenerative Medicine Research of the Japan Agency for Medical Research and Development (AMED) at AMED on July 20, 2016. It was attended by program supervisor Dr. Nakahata; sub-project leaders Dr. Nakatsuji, Dr. Kino-oka, Dr. Akutsu, and Dr. Dezawa; guests from the Bio-Industry Division of the Ministry of Economy, Trade and Industry; Ms. Takuma, director of the AMED Division of Regenerative Medicine Research, alongside personnel from the AMED who are involved in the project. There was a lively discussion of matters such as reports on the project progress and intergroup partnership. The first mesenchymal stem cell section meeting of fiscal 2016 was held by the Akutsu group at the SCA conference room on July 15, and was attended by personnel from the Ministry of Economy, Trade and Industry and the Japan Agency for Medical Research and Development. The progress of the fiscal 2016 research plans and the results including launched products were presented. There were lively discussions on the results. On July 12, 2016, the second Japan Agency for Medical Research and Development (AMED) development conference of fiscal 2016 was held by the Nakatsuji group of Kyoto University at the Institute for Integrated Cell-Material Sciences (iCeMS). It was attended by personnel from the Ministry of Economy, Trade and Industry and AMED. The progress of the fiscal 2016 research plans was reported. The next conference is scheduled to be held on November, 8, 2016. On July 4, 2016, the first iPS section meeting of FY2016 was held by of the Kino-oka group at Osaka University. It was attended by personnel from the Ministry of Economy, Trade and Industry and the Japan Agency for Medical Research and Development (AMED). There was a vigorous discussion on the progress of the fiscal 2016 research plans and the orientation for the future at the meeting. On April 19, 2016, the first Japan Agency for Medical Research and Development (AMED) development conference of fiscal 2016 was held by the Nakatsuji group of Kyoto University at the Institute for Integrated Cell-Material Sciences (iCeMS). It was also attended by personnel from the Ministry of Economy, Trade and Industry and AMED, and was devoted to presentations of the research results of fiscal 2015 and the research plans for fiscal 2016. The next conference is scheduled to be held on July 12, 2016. On April 4, 2016, AIST, a member of SCA, made a press release announcing that it developed a technology for simple and rapid evaluation of differentiation potential of hMSC. The technology is expected to contribute to industrialization of regenerative medicine using hMSC. The details were published online in an American scientific journal, Glycobiology (2016) April 2. On March 31, 2016, Nipro Corporation, a member of SCA, put out a press release stating that it launched an automated cell culture system for stem cells. 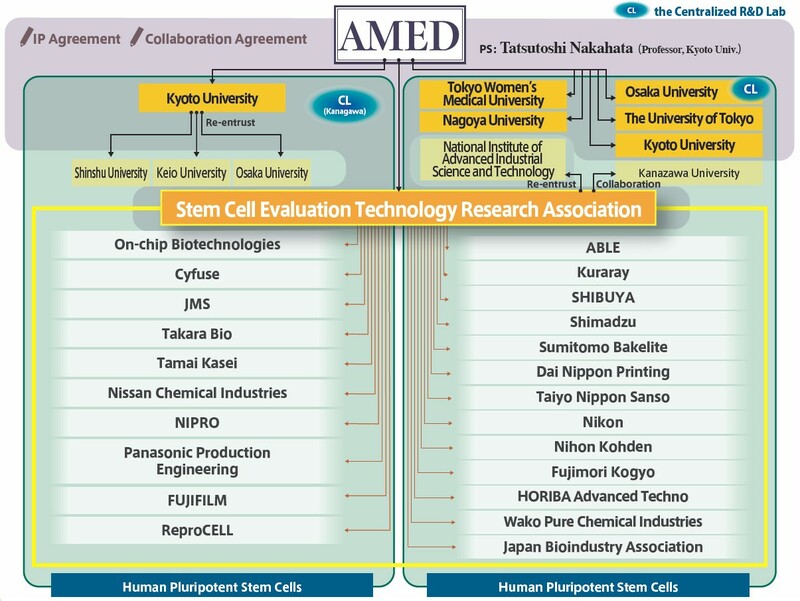 The cell culture system was developed in the former NEDO project and its performance was evaluated at Kyoto University and the National Center for Child Health and Development in the present AMED project. On February 22 – 23, 2016, the UK-JAPAN Life Innovation Symposium was held by the Nakatsuji group of Kyoto University in Tokyo Branch of Kyoto University, Shinagawa, on the first day and in the Life Science & Environment Research Center (LiSE) in Tonomachi, Kawasaki City on the second day. The symposium on the first day was hosted by Kyoto University and on the second day by Kanagawa Prefectural Government, and on both days cohosted by SCA. The preview of the Life Innovation Center (tentative name) under construction in the Tonomachi area was held on the morning of the second day. The Centralized R&D Lab. of the Nakatsuji group is scheduled to be established in the Life Innovation Center. 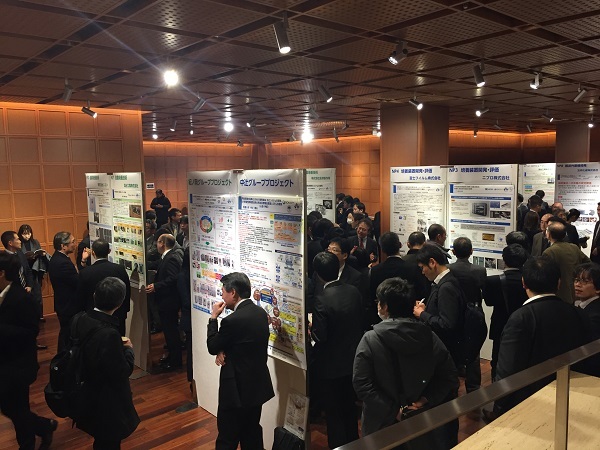 On February 9, 2016, the second user forum was held by the Kino-oka and Akutsu groups in the Tokyo Waterfront Annex of the National Institute of Advanced Industrial Science and Technology. It was held for the purpose of absorbing the needs of parties who will be the users of the project and reflecting them in the project’s promotion. The confab session was a scene of lively interchange. On January 27, 2016, the Kanagawa Prefectural Government made a press release announcing the Life Innovation Center (tentative name) under construction in the Tonomachi area in Kawasaki City, where the centralized research R&D lab. of the Nakatsuji group of Kyoto University will be established. On January 19, 2016, the fourth Japan Agency for Medical Research and Development (AMED) development conference of fiscal 2015 was held by the Nakatsuji group of Kyoto University at the Institute for Integrated Cell-Material Sciences (iCeMS). It was attended by personnel from the Ministry of Economy, Trade and Industry and AMED and was devoted to reports on the progress of the fiscal 2015 research plans. The next conference is scheduled to be held on April, 19, 2016. The second Program Supervisor/Sub-project Leader Conference of this fiscal year was hosted by the Division of Regenerative Medicine Research of the Japan Agency for Medical Research and Development (AMED) at AMED on January 15, 2016. It was attended by program supervisor Dr. Nakahata; sub-project leaders Dr. Nakatsuji, Dr. Kino-oka, Dr. Akutsu, and Dr. Dezawa; guests from the Bio-Industry Division of the Ministry of Economy, Trade and Industry; Ms. Takuma, director of the AMED Division of Regenerative Medicine Research, alongside personnel from the AMED who are involved in the project. There was a lively discussion of matters such as reports on the project progress and intergroup partnership. Zenoaq Resource Co., Ltd. of the mesenchymal stem cell group led by Dr. Akutsu, sub-project leader, has developed a DMSO-free cryopreservation solution in collaboration with the National Center for Child Health and Development and the National Institute of Advanced Industrial Science and Technology. It is scheduled to be commercially marketed on December 1, 2015. The DMSO-free crypreservation solution is manufactured in compliance with the GMP guideline, and successfully cryopreserves various cells including mesenchymal stem cells. The second meeting of the mesenchymal stem cell subcommittee of fiscal 2015 was held by the Akutsu group at the SCA conference room on November 13, and was attended by personnel from the Ministry of Economy, Trade and Industry and the Japan Agency for Medical Research and Development. The progress of the fiscal 2015 research plans and the results including launched products were presented. There were lively discussions on the results and the orientation for the future. On October 30, 2015, personnel of Mahidol University of Thailand visited the centralized R&D lab. at Osaka University to see a prototype of stem cell manufacturing and processing system. The visit was supported by the Thailand Center of Excellence for Life Sciences (TCELS), a Thai public organization. They discussed regenerative medicine in Japan, and business potential and economy of regenerative medicine with Prof. Kino-oka, sub-project leader, and others. 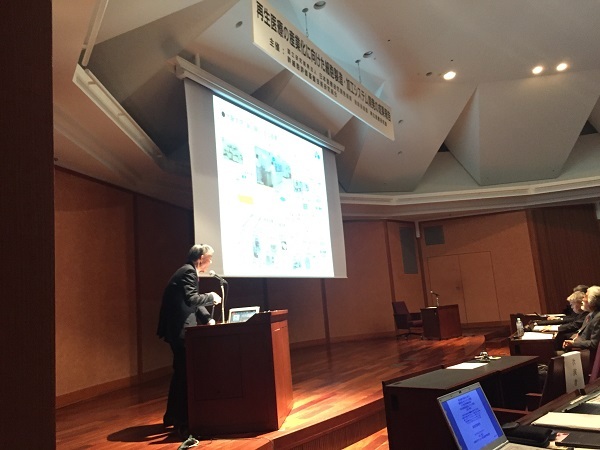 On October 20, 2015, the third Japan Agency for Medical Research and Development (AMED) development conference of fiscal 2015 was held by the Nakatsuji group of Kyoto University at the Institute for Integrated Cell-Material Sciences (iCeMS). It was attended by personnel from the Ministry of Economy, Trade and Industry and AMED. The first session was devoted to reports on the progress of the fiscal 2015 research plans, and the second session, to individual discussions between concerned personnel. Furthermore, the third session was devoted to a presentation of the Kawasaki Innovation Gateway (KING) SKYFRONT by Kanagawa Prefectural Government. The next conference is scheduled to be held on January, 19, 2016. On October 13, 2015, the first iPS section meeting of FY2015 of the Kino-oka group of fiscal 2015 was held at Osaka University. It was attended by personnel from the Ministry of Economy, Trade and Industry and the Japan Agency for Medical Research and Development (AMED). A tour to the centralized R&D lab. at Osaka University was held before the meeting and there was a lively discussion on the progress of the fiscal 2015 research plans and the orientation for the future at the meeting. On September 18, 2015, the fist Japan Agency for Medical Research and Development (AMED) steering conference of FY2015 was held at the AMED conference room in order to draw advice and recommendations about management and progress of the project from external experts. There were lively questions and answers on the reports by the program supervisor and the sub-project leaders. On September 14, 2015, Dr. Kothari, CEO, and Prof. Read, chair of the Cooperative Research Center for Cell Therapy Manufacturing (CTM CRC ), Australia, visited the the centralized R&D lab. at Osaka University. Prof. Kino-oka, sub-project leader, gave an outline description and there was a fruitful discussion with respect to the manufacturing system set up in August 2015. The first Program Supervisor/Sub-project Leader Conference of this fiscal year was hosted by the Division of Regenerative Medicine Research of the Japan Agency for Medical Research and Development (AMED) in one of its conference room on the afternoon of August 20, 2015. 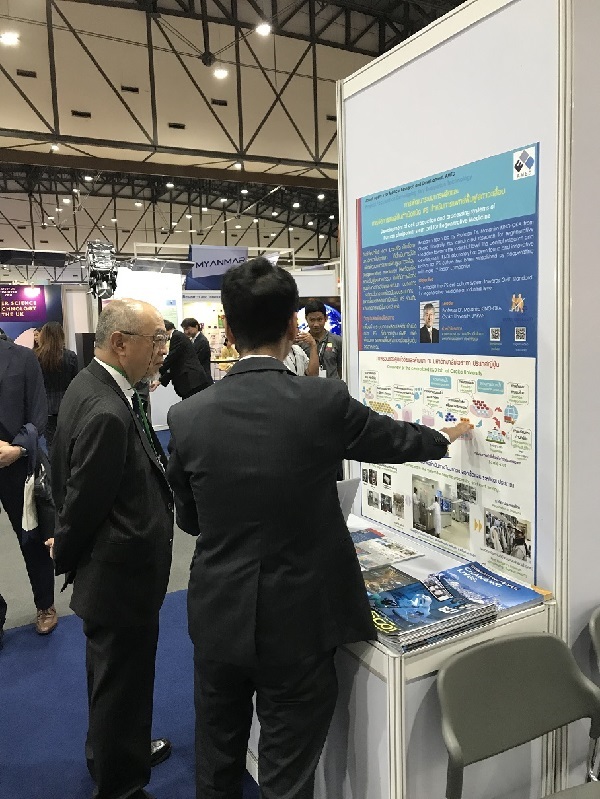 It was attended by program supervisor Dr. Nakahata; the sub-project leaders Dr. Nakatsuji, Dr. Kino-oka, Dr. Akutsu, and Dr. Dezawa; guests from the Bio-Industry Division of the Ministry of Economy, Trade and Industry; Ms. Takuma, director of the AMED Division of Regenerative Medicine Research, alongside personnel from the AMED who are involved in the project; and listeners including SCA president Mr. Yoshioka. There was a lively discussion of matters such as reports on the project progress and intergroup partnership. 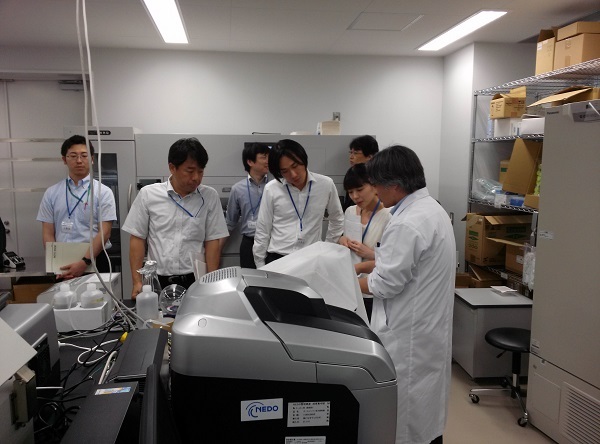 On July 10, 2015, the second Japan Agency for Medical Research and Development (AMED) development conference of fiscal 2015 was held by the Nakatsuji group of Kyoto University at the Institute for Integrated Cell-Material Sciences (iCeMS). It was attended by personnel from the Ministry of Economy, Trade and Industry and AMED. The first session was devoted to reports on the progress of the fiscal 2015 research plans, and the second session, to individual discussions between concerned personnel. The next conference is scheduled to be held on October 20. The first meeting of the mesenchymal stem cell subcommittee of fiscal 2015 was held by the Akutsu group at the SCA conference room on July 8, and was attended by personnel from the Ministry of Economy, Trade and Industry and the Japan Agency for Medical Research and Development. There were lively discussions on the progress of the fiscal 2015 research plans and the orientation for the future. The next meeting is scheduled for November 13, 2015. 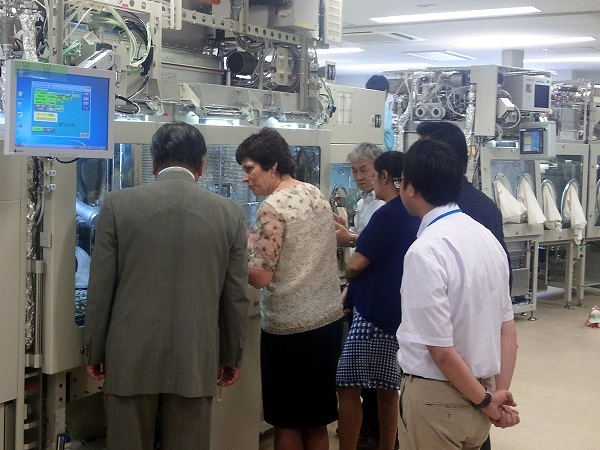 On July 1, 2015, a group of seven members of the Division of Regenerative Medicine of the Japan Agency for Medical Research and Development (AMED) led by Ms. Kiryu, deputy director, toured the Centralized R&D Lab. (CL) of the National Center for Child Health and Development (NCCDH). After opening remarks by Dr. Umezawa, vice director of the NCCDH, they listened to an outline description of the CL by sub-project leader Dr. Akutsu. This was followed by explanations of different pieces of equipment installed in the CL by the respective corporate researchers. The members of the group had many questions for the CL personnel. 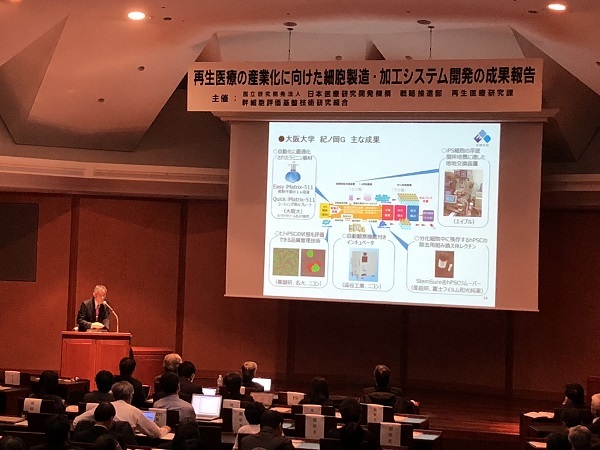 On April 14, 2015, the first Japan Agency for Medical Research and Development (AMED) development conference of fiscal 2015 was held by the Nakatsuji Group of Kyoto University at the Institute for Integrated Cell-Material Sciences (iCeMS). It was also attended by personnel from the Ministry of Economy, Trade and Industry and AMED, and was devoted to presentations of the research results of fiscal 2014 and the research plans for fiscal 2015. The next conference is scheduled to be held on July 10, 2015. On April 1, 2015, SCA concluded a contract for commissioned research and development with the Japan Agency for Medical Research and Development (AMED), which was established on the same day. The research plans for projects based on the commissioning contract with the New Energy and Industrial Technology Development Organization (NEDO) in fiscal 2014 will basically be carried over. Projects in the medical field for the ministries of Education, Culture, Sports, Science and Technology; Health, Labour and Welfare; and Economy, Trade and Industry will be seamlessly promoted in all phases from basic research to work for practical utilization. There are high hopes that this will add impetus to attainment of the goal of industrializing regenerative medicine in this project.